Talking to a friend after class the other day, she made a comment that I looked like the type to play cello in a jazz band. That made me think about West Coast jazz and how funny her comment was in that context, which led me to a hankering for some West Coast jazz. The next few posts are a result of that hankering. This album is the epitome of the 1950’s West Coast ‘cool’ jazz, from the personnel on the record to the instrumentation. In fact, when I took the record out of the sleeve to play it, a little bit of the Pacific Ocean came out, too. This is not to say that the music is effete and weak. This album is the epitome of GOOD 1950’s West Coast ‘cool’ jazz. The music swings in it’s laid-back way, the scored arrangements are written such that one almost forgets that they are in fact written out, and the spare rhythm section means nobody can hide behind a piano or guitar. Don’t feel bad if the name ‘Lennie Niehaus’ means nothing to you. I had no idea who he was when I bought this record, as his name doesn’t appear much in the jazz literature. I quickly learned about him upon hearing this album though. To be brief, he hails from Missouri, came from a musical family, joined Stan Kenton’s band in the early 1950’s, left in 1959 and began working in the Hollywood studios in the early 1960’s, where he made most of his bread and butter. A more detailed bio is on the back of this album. He’s still around and making music today. During the 1950’s, he made a few albums for the West Coast record label Contemporary, which received positive reviews at the time. 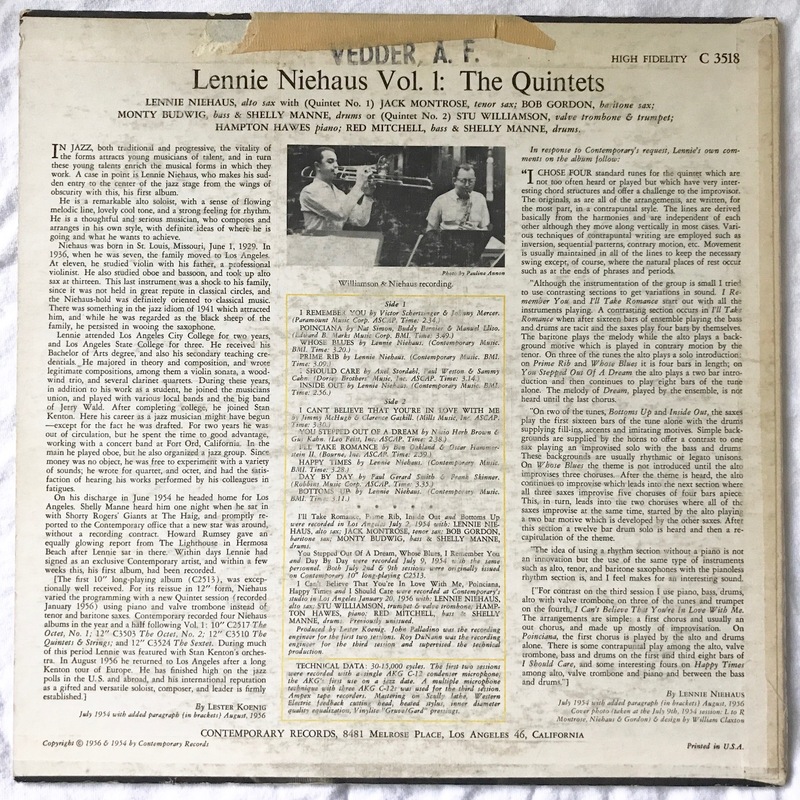 This record was the first in a series of albums that showcased Niehaus’ strong alto sax and his equally strong arrangement and writing skills. Working with Niehaus are names well-known in West Coast jazz circles. Bob Gordon and Jack Montrose were popular saxophonists on the Coast and would record with Clifford Brown the following two months. Monty Budwig would join Shelly Manne’s groups in the late ’50’s and into the 60’s as well as record with pianist Vince Guaraldi. On a separate recording date with Niehaus, valve-trombonist and trumpeter Stu Williamson, bassist Red Mitchell and pianist Hampton Hawes unite to make some swinging jazz. The original album was a ten-inch album featuring the saxophone trio plus rhythm. Two years later, with ten-inch LPs already old-fashioned, the album was expanded for the 12″ format. New tracks from a different recording session with different guys were added. These tracks have their moments, but in my opinion don’t quite have the excitement and taste that the sax trio tracks have, but the music is still enjoyable. Taken by famed jazz photographer William Claxton at the recording session, the album cover art quite literally captures the mood of the music inside the album. Apparently caught listening to playback in the studio, the guys are all in thought and concentrating on their craft. The angle of the photograph provides an interesting portrait. From left to right is Jack Montrose, Lennie Niehaus, and Bob Gordon. The black and white photography combined with the simplistic yellow lettering adds to the hip vibe. Their clothing is also a point of interest. West Coast jazz album’s cover art was distinctly different from East Coast jazz’s cover art. A typical Blue Note album from the time may feature photos of black musicians in suit and tie, sweat on their brow and caught in an action shot. They LOOK like jazz musicians. Meanwhile in LA, Claxton finds his subjects in casual clothing, looking more like librarians or college students with their cardigans, slacks, and horn-rimmed glasses. It’s solid cover art. The cover has seen better days, that’s true, but it’s still holding on. One thing that I really appreciate about Contemporary’s albums is that they were painstakingly complete when it came to album information. Personnel, the date, the location, even the recording equipment all was included. The album is an original, as distinguished by the yellow border around the album info and the address on the bottom. Like I mentioned earlier, part of this album was released as a 10″ LP in 1954, then reissued with new performances in 1956 as a 12″, hence the two copyright dates. The liner notes are informative, written by Contemporary’s own Lester Koenig and the man himself, Lennie Niehaus. The vinyl is severely deep-groove, with the classic poppy yellow labels Contemporary used during its early days in the mid-1950’s. The vinyl itself plays pretty quiet, and the sound is pretty good if not slightly low in fidelity. Every record that claims to be ‘high fidelity’ wasn’t in fact high fidelity. Contemporary Records had some of the best-sounding records west of the Mississippi, thanks in large part to their engineer Roy DuNann. This record is a mash-up of sorts, however. 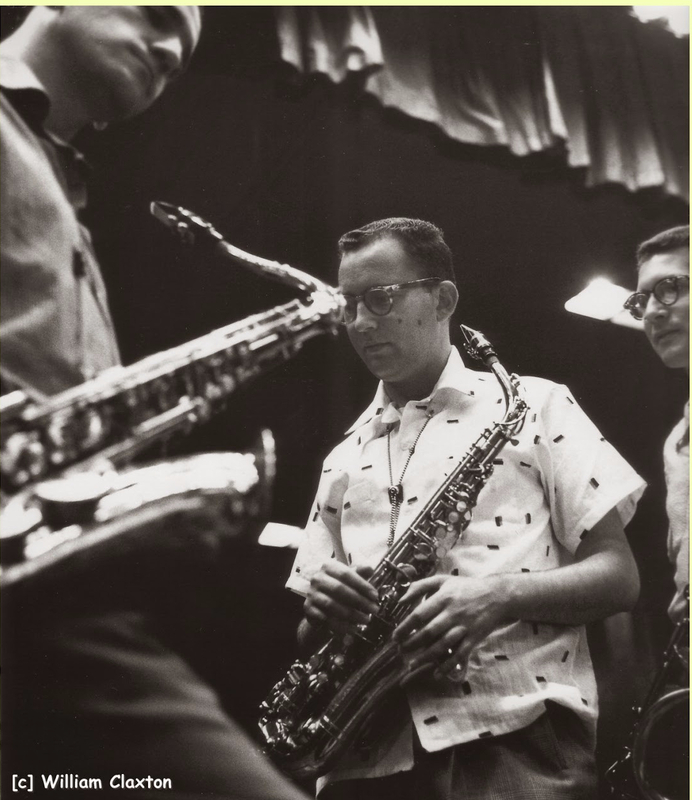 The first two sessions (the saxophone trio) was recorded by John Palladino, Contemporary Record’s engineer before DuNann showed up. The later session with Hampton Hawes was recorded by DuNann. The audible difference is slight, but it’s there. DuNann has been called the West Coast Rudy Van Gelder, which I don’t think is fair to DuNann. Van Gelder was great and innovative in his own way, and DuNann was great and innovative in his own way. I will say that, in many ways, Contemporary Records was the West Coast’s answer to Blue Note Records Back East. Both were independent record companies specializing in jazz, both had star recording engineers, and both were responsible for recording and distributing a unique type of jazz. Oh and as for the stamper code, the first side has the ‘LKL’ and it’s D7. Side two is D5, and both have the ‘H’ in the runnout. 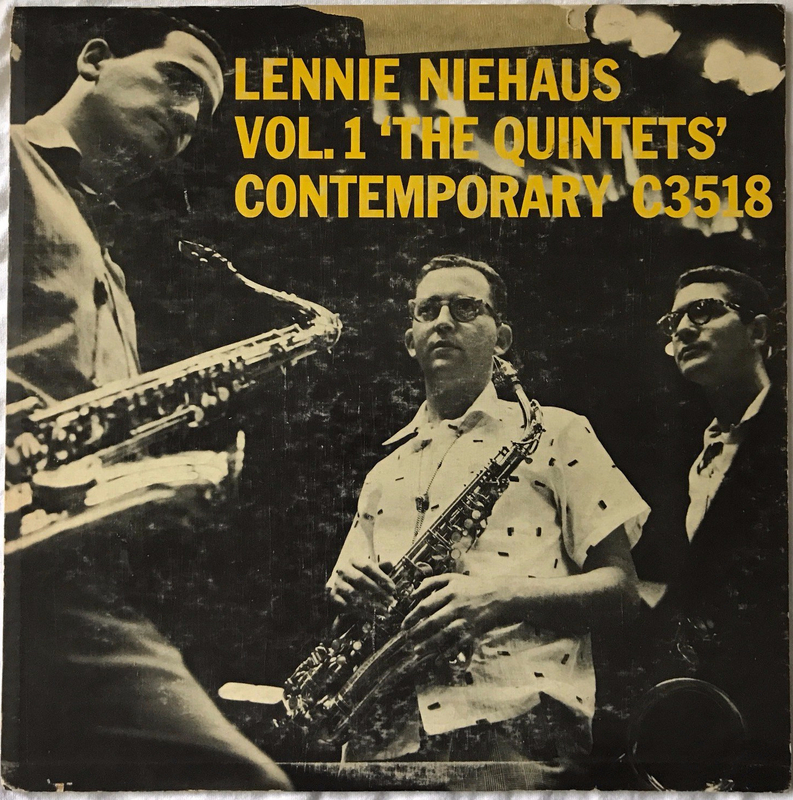 Running through the ‘new arrivals’ in the jazz section of my local record store, I came across this album and another album by Lennie Niehaus. Like I said before, I had no idea who he was, but the fact that he was on Contemporary Records’ roster intrigued me. I looked it up on my phone and found out he was one of those jazz musicians who made a few highly reviewed albums and then split. I quickly grabbed the records and ended up spinning them almost nonstop for the next few weeks. I really could do a commercial for my local record store.